Surprisingly, 71% of respondents said that they would either be happy with a 2D wargame or that it didn’t matter to them. Those are pretty overwhelming numbers. 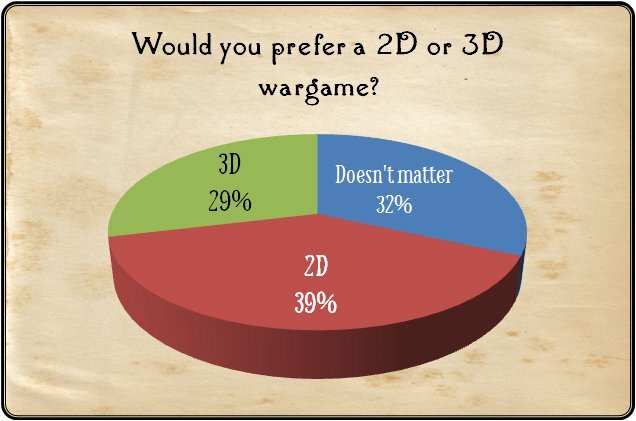 It should be no surprise that it takes a great deal more time and money to create a 3D wargame than a 2D wargame so these results are quite eye opening and also reassuring. While this flies in the face of what we were told by the ‘largest publisher of digital wargames in the world’ it nonetheless, comes directly from the consumers themselves. 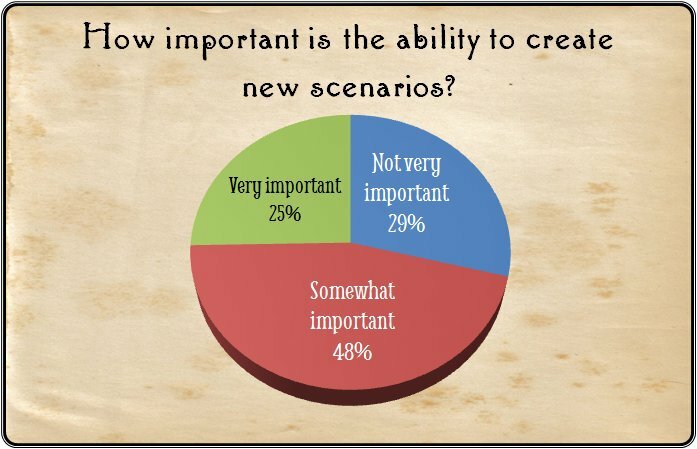 The next question was, “How important is the ability to create new scenarios?” Two of the last three games that I wrote (UMS and UMS2) provided the ability for users to create new scenarios. Creating a suite of scenario editing utilities is not trivial. Frankly, as a game designer, you normally just cobble some system together that will allow you to create scenarios for your game. Often these include XAML files and using PhotoShop or some other paint program. Frequently this system is buggy or you have to do something in a weird order for it work right. But when you create an editing suite for the public it has not only be bug-free but it has to have an intuitive and easy to use interface. Based on the your responses, below, it looks like I’ll be creating an editing suite for you to create your own scenarios. 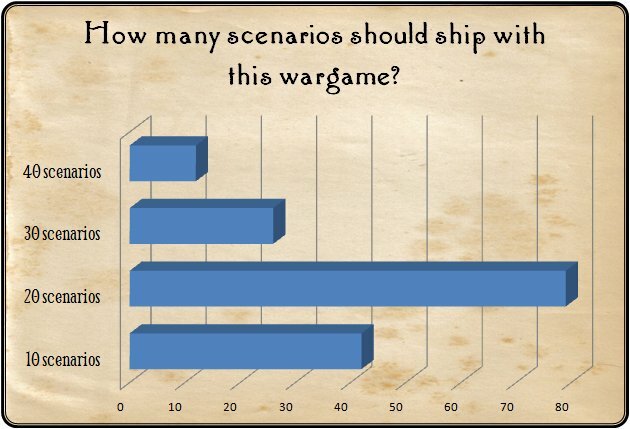 The next survey question asked how many scenarios you would like to see ship with the game. The overwhelming favorite was ’20’ and so we’ll make sure that at least 20 scenarios are included. The overwhelming favorite was 20 scenarios. Since 1986 every game that I’ve designed and written has been published by a ‘big’ computer game publisher. Game publishers traditionally give the game developer an advance against royalties and are responsible for distribution and promotion of the product. In return, they take between 50% and 85% of the gross receipts. Yes, that is correct. 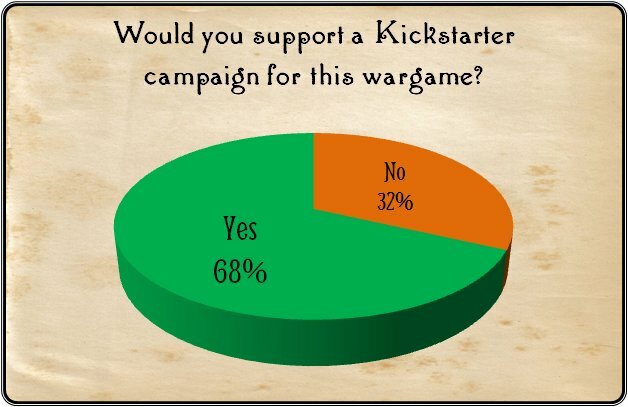 Respondents to the survey overwhelmingly said they would support a Kickstarter campaign to fund this wargame. The final question in the survey was the all important, “How much would you pay for this wargame?” It looks like a list price of $50 seems not unreasonable. Early backers in Kickstarter always get a price break for their support. I’m thinking $40 on Kickstarter, $50 after. $50 was the most popular price for this wargame. Many thanks to all who participated in this survey (N = 168). The results were surprising and very helpful. Unfortunately, I realized that there are more questions that need to be asked about gameplay and distribution, so expect another survey shortly. This entry was posted in Survey and tagged Survey, Survey results on November 14, 2016 by EzraSidran. I think you’ll find that the “largest digital publisher of wargames in the world” is often mistaken about what they believe is required. I think the survey results represent some great information. I’m really looking forward to this game. The idea of it being KS funded is very appealing and you can count on my contribution right away! I can’t thank you enough for the positive comments. I’m going to have to put out another survey, first, to get feedback on some game mechanics issues. Again, I’m still struggling with ‘advice’ from the ‘largest publisher of digital wargames’. If there’s any way I can be of assistance on anything, please let me know! You have a great history of developing incredible games and the concept for this one is another in that same vein. Being active at Grogheads, I know I’m not alone in this opinion, either. Thank you so much for the kind words! They are really appreciated! I will be putting out another survey about specific game mechanics issues (RTS vs phased movement, etc.). Then I will be putting together a video of gameplay with an eye towards a Kickstarter campaign (the results of the first survey have convinced me that this is a viable route forward). At that point, with almost no advertising budget, I’ll need all the help that I can get just getting the word out about the project and the campaign. Get some advice and do your research prior to a KS. You will need more than N=168 to propagate your network of buyers. I hope we can help you get this excellent concept up and running. The numbers keep increasing. I would be quite happy with 200 Kickstarter supporters. regarding 2D and 3d remember that you are asking your questions to a very specific group. Us “real” wargamers prefer clarity to fanciness. But in regards to getting people to buy your game fancy graphics probably count a whole lot more. Im trying to argue that this great publisher probably is right in terms of sales. That is a very good point. Chris Crawford (legendary game designer) wrote a book, “On Game Design,” that I used as a text book when I taught Computer Game Design at the University of Iowa. Chris was adamant about never adding glitzy artwork that did not add clarity to the game (specifically did not help the user make decisions, since, ultimately, that’s what a game is). I am very much inclined to agree with Chris on this. Would putting the game in 3D help gameplay? Not at all. Would it increase sales? Maybe, but not definitely. It would certainly make creating the game much more difficult (it would require a 3D editing suite which, in essence, is a mini-CAD/CAM system).